This has got me thinking about the experience and the role of the audience during the performances that have taken place over the past month or so in association with this year’s Anne Landa Award exhibition The space between us . Is the audience also in a position of vulnerability? In what ways have these performances met – or shifted – audience expectations? Most importantly, what have been the various reactions? In 'Tree of Knowledge’, Thompson transformed the Gallery’s entrance court into a sort of theatrical stage upon which he played out a series of autobiographical vignettes. Gallery goers became hushed theatre spectators. In one instance, Thompson shed the numerous hooded sweatshirts he was wearing, layer by layer. One visitor related this action to the shedding of skins, some European, some Aboriginal. Another likened the action to homosexuality and a ‘coming out’, another to a metamorphosis or transformation of sorts. Though varied, it’s interesting that audiences seemed to want to combine the meaning of each individual action or sequence in order to make sense of it all, which is natural if we consider that Thompson created the work according to the structure of how a musical should unfold. 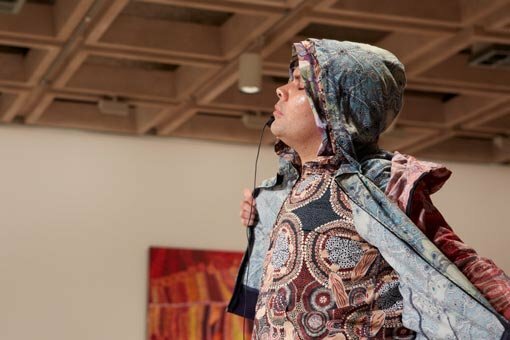 In sharp contrast is Alicia Frankovich’s The Opportune Spectator, which takes place every weekday at 12.30pm in the Gallery’s entrance court throughout the course of the exhibition. Here the audience is asked to stand in a line, which sets up a kind of active anticipation. ‘Is this interactive?’, ask many anxious visitors. And then, over the PA system booms ‘Silence, please, silence’ – an order that the audience and many other visitors throughout the Gallery dutifully obey. When sweaty joggers then run in and stand panting facing the audience, the reaction is surprisingly diverse. Some visitors move away feeling their personal space invaded, some giggle awkwardly, others look around confused waiting for something more to happen. One visitor said he felt incredibly uncomfortable, as though the performers were staring right through him. Another told me she wanted to cheer and high-five the joggers. Frankovich is interested in the action at hand or the work being done and how we pay attention to it, whether it be as familiar as running, reading, yoga, biking or working on a laptop – all of which formed part of the performance Free time. In this sense, it’s also interesting to think about the work done on the part of the audience for the artwork to take place. 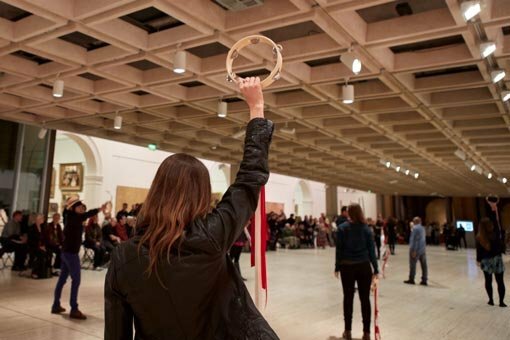 If the staged positioning of the audience and loudspeaker announcement creates a heightened sense of anticipation, then the expectation of 10 live horses at the Gallery or 50 people playing tambourines has audiences craning necks and whispering excitedly. (These large-scale performances by Lauren Brincat were the only performances in which information was revealed in advance.) On both occasions, the transition from this effect of knowing what’s coming to a hushed, mesmerised and, in some cases, perplexed state was quite dramatic. In Pythagoras, Praxiteles, Anthemius…, for example, the audience seemed to initially engage in their role as bystanders for the procession, pointing and exclaiming as the horses approached the Gallery. 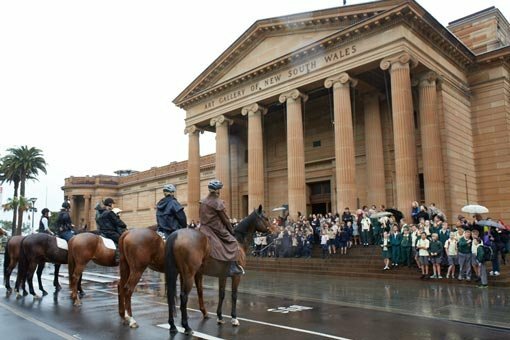 The mood soon became reverent as the horses and their female riders took position in a face-off with the façade of the institution and, incidentally, with the audience. Similarly, once the tambourine players in Blood and Fire reunited together in the Gallery’s entrance court, an intently focused gaze seemed to come over the audience, as if trying to figure out the sequences and logic of the motions. 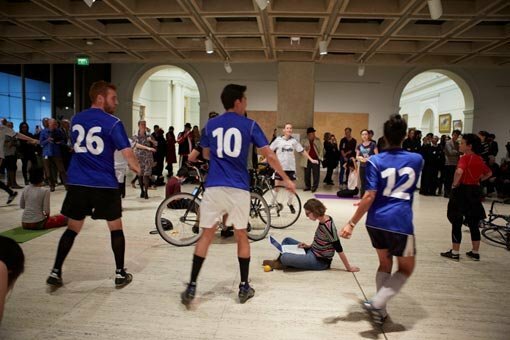 As Gallery staff, we act as intermediaries between the artist and the audience, often working with the artist to help orchestrate the logistics of the performance and, on the other side, assisting our visitors. From this perspective, it’s been fascinating to observe the ways in which artists have used the familiar spaces of the Gallery as well as the various responses of visitors to these interventions. For more insights into the artists and works in the exhibition, take a look at the Gallery Channel and the digital publication.